Frequent commenter and buddy of mine Yarddawg sent this along and it's worth sharing. Enjoy! There are many sources of information concerning organic foods. There are also many viewpoints and information sources on the subject. There is also a significant price premium (up to 60% more) consumers pay to go "organic" versus conventionally grown foods. This is BIG business and therein lies the crux. Although highly disputed by organic proponents, in 2009, the British Food Standards Agency found “There is no evidence of additional health benefits from eating organic food,” declared Gill Fine, the FSA’s director of dietary health. Organic proponents have fought back. The full Times of London article gives more insight. Another article by the popular garden writer Don Engebretson AKA The Renegade Gardener also paints an even harsher, more frightening, critique of the popular myth of the benefits of organics. Click on The Renegade Gardener and then click on Myth of the Week. It's the first article listed, named "Organically produced food is safer than conventionally produced food". It is eye-opening and, pardon the pun, food for thought. If that's not enough to make you question things this Business Week article titled, The Organic Myth, will at least make you think. The British findings conclude, both organically and conventionally grown foods are equal in taste, nutrition, and both equally safe for consumption.Proponents of organics went bonkers, in my opinion, due in part to the unpleasantness associated when the inconvenience of scientific facts disputed the prevailing organic propaganda. It's also a bit of the smallest person in the room who's usually the loudest. Organic food production is estimated to be maybe 3% of the total US food production. And, oh yeah, price too…. 60% more than "regular" food is quite an incentive to raise Hell and protect your turf. Many in the "religion" of organics have gained a rather elitist, almost cult-like following. The bad news on organics is this price premium all but excludes families struggling to make ends meet. After all, why should consumers pay way more for the same taste, safety, and nutritional value? Supermarket chains like Whole Foods and others, virtually built their businesses on the heels of the organic movement and its appeal to granola heads. If you don't believe me pick an afternoon, any afternoon, and observe the regular cast of characters frequenting any Whole Foods Supermarket. Now don't get me wrong I shop there too but I'm very selective on the items I purchase. Here's something to be aware of. Both organic growers and non-organic growers, distributors, wholesalers, and retailers have to make a profit to survive. Wal-Mart, to the dismay of many, has now joined the organic fray and many in the organic camp are not at all pleased with this development. Again, the elitist attitude possibly comes into play. The evil empire strikes again. This move is a potential game changer. If organic food ever becomes more price competitive and available to lower income consumers, a large company like a Wal-Mart will likely lead the way. I have no lower or higher opinion of a Wal-Mart than I do of a Whole Foods. They are both the same for me…. Corporations. Both businesses operate for profit and shareholder return and will do what they have to do to optimize business results and profits. It baffles me though why one entity is considered as an evil empire and the other a good corporate steward. You can also throw Trader Joe's into the same mix. TJ's $8 billion in sales and the fact it is so secretive and less than transparent makes this firm even more troubling. As you may have guessed I'm more than a wee bit cynical about organics and the purveyors of organics but not totally close minded. I like to hear differing viewpoints. I just don't buy into all the organic hype at this point. Admittedly opinions on this subject are all over the place and frankly there are many on both sides pumping out hyperbole and misinformation. Profiteers are also lurking trying to make a quick buck. The best advice for anyone seeking true information on organics is to seek out university or extension based research information which is probably the most reliable and certainly the least biased. This NC based info from NC State University is a pretty good starting point. The best advice I can give is this. If you don't grow your own food, make every effort to visit or get to know and buy from a reliable local farmer or from a local farmer's market rather than a corporation or supermarket chain. Stay close to individual farmers and eliminate as many middlemen as you can. In season follow the 40 mile rule. In other words support local and regional farmers whose transportation costs are much lower and the savings are passed on to consumers. I have routinely purchased local produce such as heirloom tomatoes for $1.50 to $2.00 per pound at local farm markets all season long. 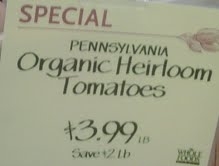 The same products from the aforementioned trendy chain were $3.99 per pound (see photo) just today and from Pennsylvania. I've seen them for as much as $5.99 out of season or when there is no local competition. By the way, is there a town named Pennsylvania, NC? Other deals of the day at WF were Bison Tenderloin for a mere $26.99 per pound and some unpronounceable French cheese for $24.99 per pound. And don't get me started on bottled water which costs somewhere in the neighborhood of $8.00 or more per gallon. Get it? The quote often attributed to P.T. Barnum ; " There's a sucker is born every minute." Well if he really said it he certainly wasn't kidding. So, when possible, I only buy fresh, in season, produce from local growers. Organic vegetables and fruits or any produce coming from Chile or milk powder shipped from New Zealand to go into a French owned, US made, organic yogurt or other place 9,000 miles away isn't very green. Fruits and vegetables from Chile in February are picked green, shipped green, arrive green,are sold green, and usually taste green for my taste. Some importers also use an artificial ripening chemical (ethylene, acetylene, calcium carbide, to name a few lovelies we consume) to mask the early harvesting taste. Canning and preserving local stuff offers superior taste versus the plastic tasting stuff available in winter any day. To find local farmers and producers in our area click on NC Farm Fresh. Then select a product and county from the drop down menus. Other options are available to filter search results even more. When possible Buy Local and remember….. Goodness Grows in North Carolina. This entry was posted in Food and Drink, Forsyth County, North Carolina, Shop Local, Winston-Salem and tagged organic food, shop local, yarddawg on August 31, 2010 by Jon Lowder. Indeed. I am a fan of the Reynolda Farm Market – down near the Children’s home on Reynolda Road – look for the Krankies Airstream – its right behind it.